It wasn't like she had not warned us. It wasn't like she had not prepared us. We'd known that something was wrong those last several months. But then, Tink hasn't actually vanished. Tink is gone, and yet—she is here somewhere, even if we can't see her. I have never read a Joyce Carol Oates novel before, but I have heard many great things about her writing. When I heard she was returning to the Young Adult scene, that piqued my interest. 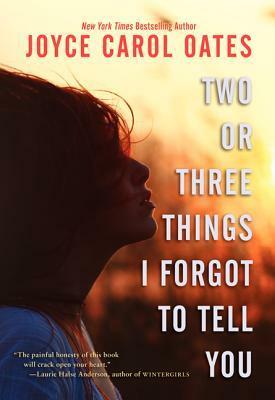 Once I learned about Two or Three Things I forgot to Tell You, and that it was along the same lines of Wintergirls and Thirteen Reasons Why(Which I both loved!) I was excited to give it a try. The book started off a little slow for me. There was a lot of character development in the beginning and not so much storyline. I was approaching about 50 pages in, and still not much was happening. I was starting to get disappointed and was wondering if I was even going to finish the novel. Slowly, but surely the story began to unfold, and boy, was I glad I kept on reading! The book is a dark and heavy read. If your looking for something light and fluffy, then I wouldn't suggest this one. The storyline, as it develops becomes quite intense. You can't help but be overcome with emotion as it plays out. The character development certainly didn't lack in this novel. In fact, I think the main aspect of this novel was character based. When thinking back now to the first 50-100 pages of Character development, I can understand why the author chose to construct the novel that way. If it had been done differently, I don't think I would have felt the same way towards the characters. The writing style was simple, yet the words came to life off the pages. I can see why Oates is a New York times bestseller. Her writing was very lyrical. If your looking for an intense, powerful read, then I would strongly suggest Two or Three Things I Forget to Tell You. It packs a lot of punch but flows beautifully. I can see this one sitting on the Literature shelf in 20 years!